Passages from "Young Goodman Brown"
Passages from "The Minister's Black Veil"
Passages from "The New Adam and Eve"
Passages from "The Man of Adamant"
Passages from "The Old Manse"
Passages from "The Procession of Life"
Passages from "The Great Stone Face"
Passages from "The Antique Ring"
Passages from "The May-Pole of Merrymount"
Passages from "My Kinsman, Major Molineux"
Passages from "Lady Eleanore's Mantle"
Passages from "Dr. Heidegger's Experiment"
Excerpt from Chapter 10 of The Scarlet Letter relating to Satan The idea that Satan, or the Black Man, lived in the forest was common among Puritans. In this passage Roger Chillingworth is unmistakably linked with the Black Man or Satan. Excerpt from Chapter 11 of The Scarlet Letter Here Hawthorne illustrates how Arthur Dimmesdale's guilty misery leads him to discount those healthy intuitions that otherwise would have allowed him to defend himself from the evil machinations of Roger Chillingworth. False in one part of his consciousness, Dimmesdale has no faith in himself and so unwittingly aids his fiercest enemy. Excerpts from Chapter 11 of The Scarlet Letter and "The Minister's Black Veil" Because of his obsession with his secret sin, which is really an obsession with himself, Arthur Dimmesdale can take no pleasure in the world around him. Instead, as Hawthorne emphasizes here, his world is one of phantasms, an interior world pale and inferior to the rich wonders around him to which he has grown blind. Similarly, Reverend Hooper of "The Minister's Black Veil" cuts himself of from the world and literally dims his sight as he hides his face behind what is for him, his parishioners, and the reader a symbol of secret sin. Excerpt from Chapter 14 of The Scarlet Letter relating to Satan Roger Chillingworth readily identifies himself with a fiend in connection with his torturing of Arthur Dimmesdale. Satan is commonly referred to as the fiend. Excerpt from Chapter 20 of The Scarlet Letter Even as he is about to consciously choose flight over confession, Arthur Dimmesdale still cherishes the outward appearance of holiness, a failure Hawthorne describes as "pitiably weak" and which we may understand to be Dimmesdale's deepest descent into hypocrisy. Excerpt from Chapter 11 of The Blithedale Romance relating to Satan Hawthorne suggests Westervelt's evil is of a particular Satanic variety. The devil peeping out of Westervelt's black eyes would be the same that visited Adam and Eve in Eden. Excerpt from Chapter 11 of The Blithedale Romance relating to Satan Hawthorne pictures Professor Westervelt much as he has the devil in "Young Goodman Brown." 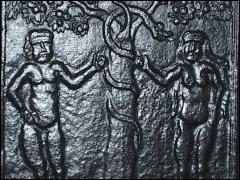 Note that in both stories, these figures carry a stick carved in the shape of a serpent. Excerpts from "Young Goodman Brown," The Blithedale Romance, and The Scarlet Letter read in the context of John Winthrop's "Model of Christian Charity"
Excerpt from "Young Goodman Brown" related to Satan Hawthorne often used a figure recognizable as the devil to suggest a confrontation with evil or, as in this case, a journey toward evil. Excerpt from "Young Goodman Brown" related to Satan Hawthorne often used a figure recognizable as the devil to suggest a confrontation with evil or, as in this case, a journey toward evil. Here Goody Cloyse is pictured as a witch meeting up with Young Goodman Brown's companion, the devil himself. Full text of "Young Goodman Brown"
Two passages from Hawthorne's "The Minister's Black Veil"
These passages dramatize Hawthorne's interest in the Satanic. Excerpt from "The Minister's Black Veil" Sadly, Hooper's veil, which is a figure for his sin, separates him even from Elizabeth who loves him truly as is evidenced by her life-long loyalty. Like Arthur Dimmesdale of The Scarlet Letter, Hooper lives a lonely, pitiable life even as he is a celebrated minister. Excerpt from "The Minister's Black Veil" In a passage which verges on the humorous, Reverend Hooper becomes frightened when he catches a glimpse of himself in a mirror. The isolating sin typified by the black veil appalls even Hooper and allows the reader some insight into the terrifying loneliness Hawthorne imagined waiting for those who set themselves above others. Full text of "The Minister's Black Veil"
Excerpt from Melville's review of Hawthorne's Mosses from an Old Manse, "Hawthorne and His Mosses," first published in The Literary World, vol. 17, 24 August, 1850. In this excerpt Hawthorne's perspective is linked to influence by the Calvinistic Doctrine of Original Sin. Melville finds this element in Hawthorne to be a source of both strength and mystery. Full text of "Hawthorne and His Mosses" - Review of Mosses from an Old Manse by Herman Melville. Excerpt from "The New Adam and Eve" When Hawthorne's imagined pair, the new Adam and Eve, tour Boston, they visit a jail, which, like the entire city, has been emptied of its human inhabitants. In this passage, he makes it clear that Love, a treatment never tried, might well be the antidote to sin. It is helpful to compare this passage with the representation of Mary Goffe in "The Man of Adamant." Full text of "The New Adam and Eve"
Excerpt from "The Man of Adamant" As the man of adamant, Richard Digby spurns the curative water offered by Mary Goffe, who had been a convert to his teachings before his heart turned to stone. Mary's sad, kind charity in the face of Digby's churlishness offers an idea of Hawthorne's idea of spiritual virtue for at the end of the passage Mary Goffe is called a "dreamlike spirit, typifying pure Religion." Full text of "The Man of Adamant"
Excerpt from "The Old Manse" In a passage reminiscent of one of Thoreau's descriptions of Walden Pond, Hawthorne metaphorically suggests that as the Concord river or even a lowly mud puddle can reflect a glorious sky, so the meanest human retains some "infinite spiritual capacity." Full text of "The Old Manse"
Excerpt from "The Procession of Life" While Hawthorne continually demonstrates a fascination with the ways in which human beings can turn themselves into demons, he does, on occasion, offer hints about how we can become angelic. In these two passages, Hawthorne offers visions of virtue at work in the world. Excerpt from "The Procession of Life" It would appear that for Hawthorne humility is a precondition for virtue. In this passage, when the Good are called to march in the procession of life, none answer the summons, not because there are no worthy people, but because part of being worthy is the recognition of one's own shortcomings. Excerpt from "The Procession of Life" For Hawthorne, to be good is to withhold judgment of others. Were one to take delight in the suffering of another or to imagine that another's crimes were deeds entirely out of the realm of personal possibility, those judgments would be evidence of a tainted spirit. The truly virtuous, for Hawthorne, experience themselves as capable of the most grievous errors. Full text of "The Procession of Life"
Excerpt from "The Great Stone Face" In sharp contrast to the hypocritical Reverend Arthur Dimmesdale of The Scarlet Letter, Ernest, also a preacher, has a simplicity of heart and mind that make him not only an effective minister, but also incapable of recognizing that he is the redeeming personage for whom he, and others, have waited a lifetime. Where Dimmesdale is all tortured vanity, Ernest is serene humility. Full text of "The Great Stone Face"
Excerpt from "The Antique Ring" In this passage Hawthorne suggests that the human heart, once freed from Falsehood, would shine with the purity of a diamond. As the story suggests, Falsehood can be defeated by acts of unconditional charity or Love. Full text of "The Antique Ring"
Excerpt from "The May-Pole of Merrymount" The image of "Gothic monsters" frolicking around a may-pole and the stern Puritan judgment upon such a scene brings to mind the harsh judgment of Young Goodman Brown when he witnesses what he takes to be a witches Sabbath in the wilderness. In both cases, it is clear that whatever the true nature of the gatherings, the Puritan who comes up then brings to them a point of view darkened by a preoccupation with sin and evil. Excerpt from "The May-Pole of Merrymount" In contrast to the forced mirth of the "Gothic monsters" who comprise the Merrymount crew, Edgar and Edith share premonitions of "care and sorrow, and troubled joy," the products, it seems of the "real passion" they feel for each other. Genuine feeling brings them face to face with the genuine condition of human beings, a condition of mixed pleasure and pain. Excerpt from "The May-Pole of Merrymount" In these contrasting passages, it is clear that if the Puritans, as exemplified especially by Endicott, are grim, iron visaged, and mirthless, the inhabitants of Merrymount are equally discouraging on their side in that their mirth is a matter of policy rather than a matter of the heart and keeps them, in some instances, from real happiness. It appears that Hawthorne suspects doctrinal gloom is as empty as enforced cheer. Neither represents a genuine response to human experience. Excerpt from "The May-Pole of Merrymount" Hawthorne makes clear in this passage that it is religious intolerance that drives Endicott and the other Puritans in destroying Merrymount. The particularly cruel and unsavory quality of Endicott's narrow-minded views is expressed in his willingness to shoot the poor bear. Excerpt from "The May-Pole of Merrymount" The "mutual support" and "pure affection" Edgar and Edith share places them outside both the Puritan gloom and the false mirth of Merrymount. Because they truly care for each other, the pair transcends systems and doctrines and, in the touching willingness of each to sacrifice for the other, we can see hinted the central message of Christianity. Excerpt from "The May-Pole of Merrymount" Hawthorne mitigates his unflattering portrait of Endicott by having that stern Puritan recognize the genuine virtue in Edgar and Edith's affection. He also suggests that their ascent to heaven is a consequence of their mutual support, a variant of their mutual willingness to accept the other's punishment. Full text of "The May-Pole of Merrymount"
The "little metropolis of a New England colony" Robin enters at the beginning of "My Kinsman, Major Molineaux" is a nightmare of moral and physical darkness in which his innocence is an affront to most of the townsfolk and an opportunity for others. His inquiry after his kinsman, Major Molineux, offends in turn the man of authority, the innkeeper, and the night watch who threaten him with either time in the stocks or arrest. Of those who appear to befriend him, the prostitute and his companion at the story's conclusion seek instead varying versions of exploitation. Robin successfully avoids the blandishments of the "dainty little figure" but is no match for the urbanity of the figure he meets later on whose interest appears to be first witnessing the young man's loss of innocence and then recruiting him for citizenship in the dark city to which Robin has traveled. Excerpt from"My Kinsman, Major Molineux" In the culminating moment of the tale, it is as if all the forces of the "little metropolis" are joined both in ridiculing Major Molineux and in inviting Robin's complicity. That he does not resist, that he's overcome with "a sort of mental inebriety," which leads to his spontaneous and heartfelt shout of laughter which was the loudest of all, allows the reader as well as Robin's urbane companion to understand that Robin has chosen to ally himself with the mob of fiends. Excerpt from"My Kinsman, Major Molineux" Robin's recollections of "domestic worship" at his rural childhood home serve as sharp contrast to the urban dangers that surround him in the metropolis of his kinsman. That the latch falls into place as he would enter that home suggests not so much that Robin has been excluded, but rather, as his spontaneous shout at the end of the tale hints, he may have chosen the realm of fiends over his past life of innocence. Excerpt from"My Kinsman, Major Molineux" In this passage, Hawthorne makes clear that whatever Major Molineux's political sins may have been, those who take such delight in "trampling on an old man's heart" are themselves far greater sinners in that their behavior makes them "like fiends." Excerpt from"My Kinsman, Major Molineux" In his confrontation with the apparent leader of the party that tars and feathers Major Molineux, Robin encounters a character painted in such a way as to seem like two fiends combined into one, a clear suggestion that whatever the reasons may have been for punishing Robin's kinsman, the punishers were themselves evil characters. Excerpt from"My Kinsman, Major Molineux" In contrast to the sylvan place of worship Robin remembers from his home, this urban church, abandoned in the darkness of the night, may derive its sanctity from the absence of "impure feet within the walls." The suggestion is that those who comprise the band of fiendlike rebels are the very ones who would destroy the holiness of the place. Full text of "My Kinsman, Major Molineux"
Excerpt from"Lady Eleanore's Mantle" Here Jervase Helwyse, in an attempt to draw his beloved Lady Eleanore back inside the circle of human sympathy, pleads with her to drink from the communion vessel from the Old South Church. She refuses, but the connection between the religious communion rite and the possibility of salvation is made explicit. Excerpt from"Lady Eleanore's Mantle" These contrasting passages suggest that if aristocracy, and those who admire it, will not recognize in the course of ordinary life that we all share "human sympathies," then we will make that discovery when we share the human miseries to which we are all susceptible. It is as if Hawthorne is making clear that while social excesses may be distributed unequally, physical pain is not and it is that which binds us to each other at last. Excerpt from"Lady Eleanore's Mantle" In these remarkably provocative passages, Hawthorne suggests that pride is tantamount to death. In the first the maddened Jervase wants to see Lady Eleanore one more time and proclaims, "she and death sit on a throne together." In the second the connection between the mantle that both enhances her beauty and contains the small pox and the haughty scorn she feels because of that beauty is made explicit. It is as if the pestilence that ravages Boston is the pride. The people believe that her "pride and scorn evoked a fiend" and so Hawthorne underscores the terribly destructive power of Lady Eleanore's sin. Full text of "Lady Eleanore's Mantle"
At first a puzzling tale, "Dr. Heidegger's Experiment" appears to show us that age brings no wisdom, only fatigue. Heidgger's demonstration with the rose shows he already knows that the water will rejuvenate his friends. The experiment must be, then, an inquiry as to whether these four would employ the lessons they gained as they aged. They don't, despite his warning, and the doctor concludes that he wants no part of the water, presumably, to save him from a repetition of the mistakes he himself made when young. What are those mistakes? A careful reading of the description of his study offers some intriguing clues, and one sees that, while the doctor's four friends are certainly beset with serious faults, none is as dark as those of the doctor himself. Excerpt from "Dr. Heidegger's Experiment" In this complicated passage, the contents of Dr. Heidegger's study reveal his interests, past, and proclivities. As much sorcerer as physician, Heidegger is yet another of Hawthorne's characters whose intellectual pride leads them astray. That he dabbles in the dark arts makes his character questionable. It is, however, the suggestion, inherent in the story's title, about his relationship with his lover, Sylvia Ward, that demonstrates the true darkness of the old man's spirit. Excerpt from "Dr. Heidegger's Experiment" That Dr. Heidegger does not himself partake of the drink he offers his friends is one of the indicators that he separates himself from others, remaining aloof, a cool observer of experience rather than full participant in it. In this he reminds one of Hawthorne's other famous Doctor, Roger Chillingworth, of The Scarlet Letter who carefully scrutinizes the agony Arthur Dimmesdale's experiences as a result of Chillingworth's manipulations. Excerpt from "Dr. Heidegger's Experiment" In this passage Dr. Heidegger scolds his friends for not having used the lessons they learned in aging to prevent them from being foolish once they regained their youth. While Heidegger's observations of the four are accurate, the passage leads the reader to wonder what shortcomings beset Heidgger when he was young. Excerpt from "Dr. Heidegger's Experiment" Here the doctor warns his friends about the potential "sin and shame" they risk by drinking the rejuvenating water he offers them. Excerpt from "Dr. Heidegger's Experiment" That Hawthorne provides such a detailed account of the youthful failures of Dr. Heidegger's four friends not only sets up our understanding of their return to these bad habits, but also prompts us to wonder what Dr. Heidegger's own failures might have been. Excerpt from "Dr. Heidegger's Experiment" In this passage we see the subjects of Dr. Heidegger's experiment revert to their sinful ways. It is this reversion that teaches the doctor to scorn the water of the Fountain of Youth and leads the reader to the amusing, if discouraging idea, that we do not gain wisdom with our years. Full text of "Dr. Heidegger's Experiment"